Powdercoating offers a large colour choice, protection to the aluminium and easy of maintenance. Today’s new generation of UV resistant finishes are available in a wide range of warrantable standard, metallic and pearlescent colours. Warranties range from 5 years to 15 years depending on the specifications and requirements of the installation. This unique European designed powder coating system offers a selection of timber grain finishes. 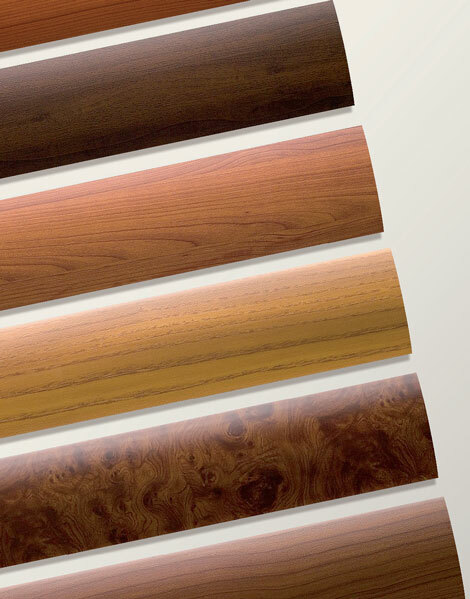 These premium wood grained finishes look so like timber it’s not easy to believe it is powdercoating. Anodising is a tried and proven electromechanical process that produces a smooth hard wearing oxide coating on the aluminium resulting in a deep metallic lustre, the most popular colour option being clear or silver anodised finish. It is a very durable surface with the lifetime dependent on the density or thickness of the anodic film. This can range from 12 to 25 microns depending on the application. Washing twice yearly with a soft brush and mild detergent is all that is recommended. With regular cleaning, typically clean water with a mild detergent, anodised material will retain its original integrity for no less than 10 years. For more information contact Modular.